This is really cool. On Friday the 26th, I was a passenger on the Lou Seal-ebrity Ride of the Game! 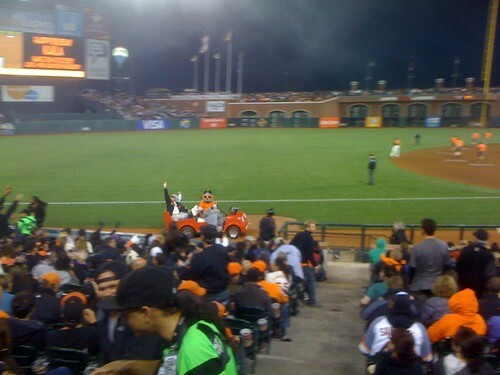 That's right, I scored a ride around the ballpark at the end of the third inning. You might be thinking... how did Akit afford to pay $400 to ride around the ballpark? The answer is, I didn't pay anything; I won it! I got a call the week before and the lady said, "hi, I'm calling from AAA." I thought to myself, oh crap, what did you do to my membership and insurance? She then told me I was the winner of four Giants tickets; okay... good! 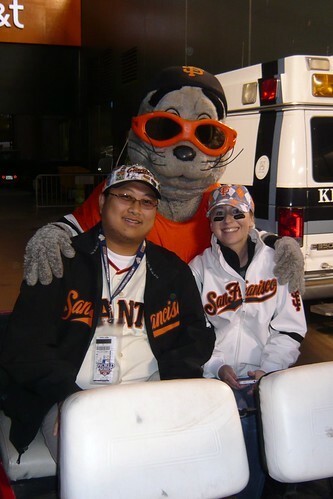 And to top it all off, I won a ride with Lou Seal around the ballpark! It turned out it was a text to win raffle I entered when I was at a July giants game and noticed on the scoreboard information on how to enter. So I took a punch in the arm, put my info into the cell phone and took a chance at fame. I got an e-mail later that day with all the information I needed to know, and gathered up three people to come along with me; the only people I could find are my co-workers I work and I dragged them along with me for the fun. I could only pick one person to tag along with me on the golf cart, and I picked my fellow SF State colleague, Amanda. The group (not including me) was two guys and one lady; as a gentleman, I gave up my second seat on the policy of 'ladies first.' The two other guys wanted to bribe me to take them, but even then, I didn't want their money, nor let them pay me for their ballgame tickets. It was quite interesting. Two reps from the Giants came to our seats to pick-up Amanda and I, and we were waiting for Lou Seal's arrival and the end of the third inning for the moment to shine. That cart driver went FAST! So fast that my other co-worker, Ryan, was able to take a blurry picture of us passing by. At least my famous pin hat didn't fly off in the process. That was definitely a lot of fun and once in a lifetime opportunity. Congrats Akit!! From one fellow Giants fan to another, that is probably one of the best contests to win!!! So jealous.